Movavi Photo Editor for Windows XP - graphic editor for quick editing photos. The application contains a guide with a description of functions and a system of tooltips, allows you to combine images by dragging objects, contains a tool for selecting the borders of the elements of the picture, means for changing the background, filters with the ability to preview the results. The program allows you to change the size, format and orientation of photos in batch mode, includes a module for adding text, aligning the horizon. The editor supports undoing and converting to various raster formats. 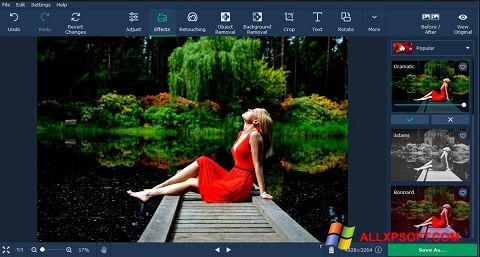 You can free download Movavi Photo Editor official latest version for Windows XP in English.